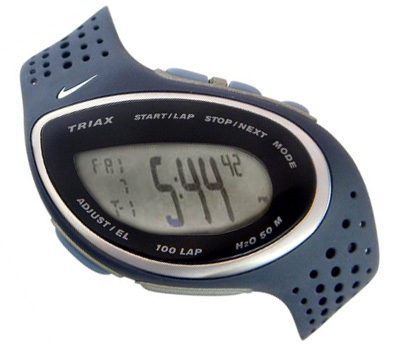 This Nike Triax Stamina is not produced anymore but came in several color editions: Black/Soft Grey (WR0051-001), Carbon/Blue Chambray (WR0051-002), Azure/Lt Graphite (WR0051-003), Grey/Light Sage (WR0051-004), Lt. Graph./Sport Red (WR0051-005), Graphite/Varsity Maize (WR0051-009), Madeira/Grey Slate (WR0051-202), Lime Ice/Light Graphite (WR0051-302), Apollo Blue/Lt. Graph. (WR0051-405), Grey/Orange (WR0051-999). It looks like Mark Wahlberg is sporting the Carbon/Blue Chambray (WR0051-002) version, looking at the dark blue case/band and blue buttons. The WR0051 is a slightly larger version of the WR0050. The Nike sports watch features dark blue rubber strap, lap/split display, 100 lap memory, countdown, timer, date, 5 alarms, 2 time zones, water resistent to 50 meters, mineral crystal Japan Quartz movement, buckle clasp. This model is currently not available anywhere anymore, but on eBay you can sometimes find one or two. 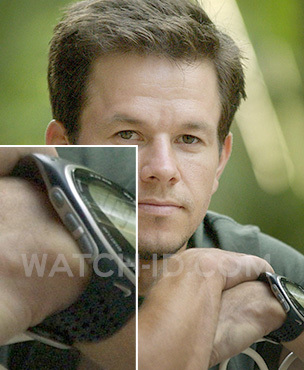 See more watches worn by Mark Wahlberg.